It is currently Sat Apr 20, 2019 4:16 pm. I was talking to some people at WBB that didn't realize the in game chat worked. So, here's some info on it. If you don't wanna use IRC all the time you can chat in game (without being near people and stuff) using conferences. If you use a newer client you might not be able to do any of this stuff. 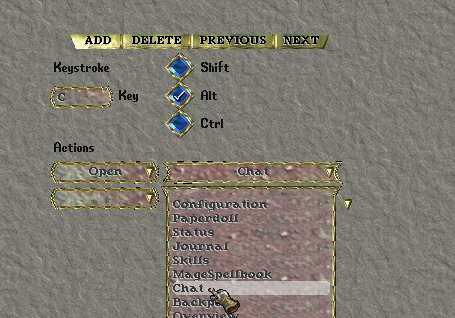 All you've got to do is make a hotkey to open it, or just click "Chat" on the menu bar. 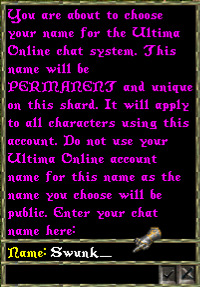 However you go about deciding to open up chat, you will then be asked to pick a unique name that you cannot ever change and that is tied to your account. It's pretty cool though. You can make your own conferences, password protect them, multiple chat windows can be open at once and the windows are even resizable. Try it out some time with your wizard friends. It would be amazing if #secondage could be integrated into this as the primary IRC client for the server... the UO client itself. In Game chat is disabled on UOSA. That Chat system is hardwired to Origin, EA servers. Pre-6.x clients support the ingame chat feature, press T to open. I believe Roser has a funky fresh idea. Sorry, had to be said.. I'm all for Roser's suggestion. Only, such a major change might not be feasible. Good question Cromwell. I was hardly a master at UO back then, but I seem do remember there being an in game chat function. Yes. It came out with T2A. An idea. A funky fresh idea.